I was very excited at the idea of getting rid of my tummy pooch. Recovery continued from my abdominoplasty or tummy tuck surgery and my abdomen turned all the shades of the rainbow and was pretty swollen. Wearing the post-op binder that was provided, helped a lot of relief and support. I went back to work on post-op day 6. I work in an office, so I was able to structure my day so that it was comfortable. I walked around hunched over for a few days, but eventually was able to stand upright. It helped a lot for me to be able to get up and go to work. It was nice to be back in to my normal routine. Slowly but surely my pants fit again as the swelling went down. There was one thing that was very difficult: lower back pain. It lasted 2 weeks, and it was horrible. It was almost worse than the soreness in my abdomen. I never realized how important abdominal muscles were for my posture! 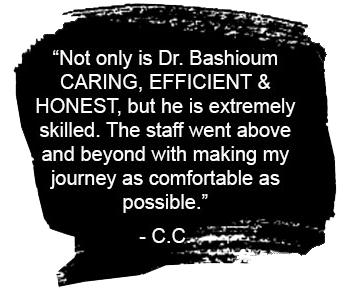 I did reach out to the office staff and Dr. Bashioum a few times with post-operative questions. Everyone was so gracious â€“ I truly felt spoiled!